Found a great Australian supplier (for any Aussies's here), MLN. Just got the Belkin PlayMax router (for under $200AUD) and am now getting much better internet speed. Instead of 4-5mbs on both wireless and Ethernet I'm getting 10-12mbs wireless and 17mbs+ on the Ethernet on the DM3. Finally got a perfect system. Only thing is upload speed. Any ways to maximize upload? 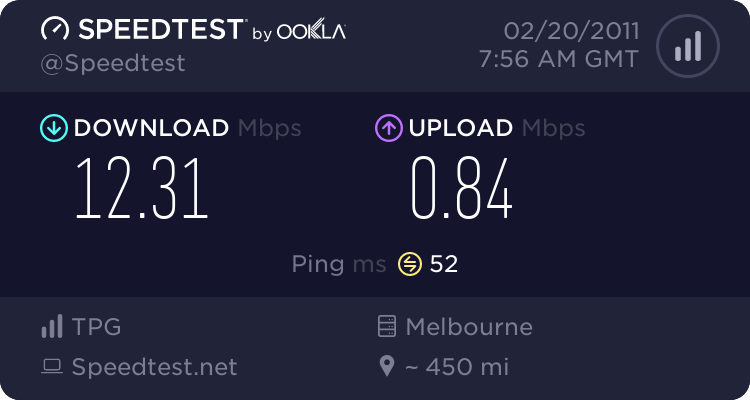 Or is >1mbs normal? caused by my mistake of leaving it on on a 47*c day. Ended up getting a bargain on the HP Pavilion DM3 (Core 2 Duo, 13" Screen, 512mb nvidea graphics, 4gb ram and a 320gb 7200rpm HD) for $579.